Taking Note: Friday . 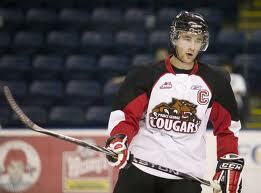 . .
Brett Connolly of the Prince George Cougars has his first NHL contract. F Brett Connolly of the Prince George Cougars has signed an entry-level contract with the NHL’s Tampa Bay Lightning. The signing has yet to be announced but a source familiar with the situation tells me that it’s a done deal. Connolly, 19, was the sixth overall selection in the NHL’s 2010 draft despite the fact that hip problems had limited him to 16 games in the 2009-10 season. He was the first No. 1 selection made by Tampa Bay GM Steve Yzerman, who was running his first draft with the Lightning. Connolly, who is from Prince George, enjoyed a healthier 2010-11 and put up 73 points, 46 of them goals, in 59 games. Unfortunately for him and the Cougars, his season ended in the first game of the playoffs when he suffered a shoulder injury in Kelowna against the Rockets. Kelowna went on to sweep the Cougars. In 144 regular-season WHL games, Connolly has 152 points, including 86 goals. Hockey Canada is running its elite goaltending camp this weekend in Calgary as it continues to evaluate players with an eye towards the 2012 national junior team. There is some consternation because Canada just isn’t producting goaltenders the way it did in the recent past. Maki’s complete story is right here. THE COACHING GAME: The Simon Fraser University hockey team is looking for an assistant coach to fill a spot that had been occupied by former Tacoma/Kelowna Rockets D Burt Henderson. If you’re interested in joining the SFU staff, check out www.sfuhockey.com or contact GM Jeff Dubois via email at hockey@sfu.ca. As the teams head back to Boston for Game 6 of the Stanley Cup final, it strikes me, and I’m sure some other sports fans, that this series bears something of a resemblance to the 1960 World Series. At least, it does if you consider the scores. That World Series featured the Pittsburgh Pirates, who had home-field advantage, and the New York Yankees. The Yankees won Games 2, 3 and 6 by scores of 16-3, 10-0 and 12-0. The Pirates won the other four games — 6-4, 3-2, 5-2 and 10-9, winning Game 7 on Bill Mazeroski’s walk-off home run. Add it all up and the Yankees lost the World Series despite outscoring the Pirates, 55-27. In this Stanley Cup final, the Vancouver Canucks won the first two games — 1-0 and 3-2 in OT — and then took Game 5, 1-0, on Friday night. The Bruins were victors in Games 3 and 4, by 8-1 and 4-0 counts. So, through five games, the Canucks hold a 3-2 edge, although they have been outscored, 14-6. Game 6 is to be played Monday night in Boston with a seventh game, if needed, scheduled for Vancouver on Wednesday.